Obama and the Dems: Look Forward or Back? The budget that just passed both houses of Congress has given the prospects for health-care reform this year a big boost. With the inclusion of procedural language that would make it impossible for opponents to filibuster, it will now take a simple majority to pass the Senate, rather than 60 votes, simplifying the political arithmetic considerably. Trying to meet that ambitious goal in such a short time frame may make it hard for lawmakers to make the wisest policy choices. Though advocates say that fixing the health system promises big savings over the long haul, it will take some big, up-front investments  in technology and preventive care, for instance  whose benefits will not begin to take effect for years. And most of the savings will accrue not to the Federal Government  whose direct costs for health care are felt largely through the Medicare and Medicaid programs  but to the economy writ large, where health care now accounts for about 17% of all spending, more than double its percentage in 1970. "Ironically, the things that may wind up being the most important are the things that we will get little or no credit for" under the budget rules, says White House Office of Management and Budget Director Peter Orszag. So daunting is the prospect of passing a bill that fits the confines of a pay-as-you-go budget that a coalition of 30 organizations pushing for health-care reform  including the U.S. Chamber of Commerce, organized labor, the drug lobby, AARP and organizations representing hospitals, doctors and patients  wrote a letter in March asking lawmakers to suspend the rule with respect to health-care reform. But officials at both ends of Pennsylvania Avenue say that would be political suicide at a time of record deficits  and a guarantee that Republicans and fiscally conservative Democrats would not support the plan. One of the biggest ways to raise money to pay for health-care reform is also the most politically delicate: taxing employer-provided health benefits. It's an idea that Obama criticized when his opponent John McCain proposed it during last year's presidential campaign, but one that his top White House advisers now say should remain on the table. And it is an approach that Senate Finance Committee chairman Max Baucus says he is considering. It's easy to see the appeal, if you look at the numbers. The Congressional Budget Office has estimated that fully counting employer-provided health benefits as taxable income could bring as much as $246 billion a year into federal coffers. But the politics of taxing something that workers now believe they get for free would be treacherous. More likely than a total elimination of the favorable tax treatment is the prospect of putting some kind of limit on that deduction  forcing workers to pay taxes, for instance, if their employer offers a particularly lavish plan. Or lawmakers may come at it another way, curbing the tax deduction that companies can take for offering those benefits. Such choices get to the real truth behind the cold hard numbers of health-care reform. Every one of them is a political calculation, one that pits one constituency against another. 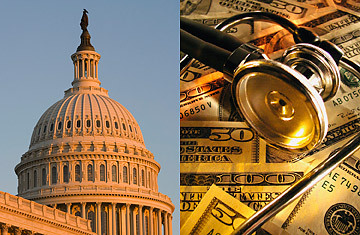 Can lawmakers really balance the books on health-care reform? "You can do it," says former Senate majority leader Tom Daschle, a leading voice in the health-care-reform effort. "It's just a matter of how much pain you want to endure."